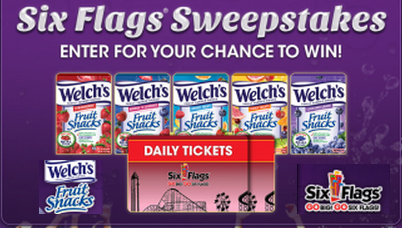 Welch’s Fruit Snacks Six Flags Instant Win Giveaway - 142 Winners Each Win 2 Six Flags Amusement Park Tickets and Win Free Welch's Fruit Snacks. Daily Entry, Ends 8/31/18. GOOD LUCK!! Grand Prize (2 total): Two (2) 2018 Six Flags Season Passes to the Six Flags U.S. Theme Park of winner's choice and one (1) box of Welch's® Fruit Rolls (ARV $542.99 each). Valid for 2018 operating season only. First Prize (140 total – as broken out above): Two (2) single-day general admission ticket to the Six Flags U.S. Theme Park of winner's choice and one (1) box of Welch's® Fruit Rolls (ARV $172.99 each). Valid for the 2018 operating season only.